A Miami Beach, Florida security company is going to take on a great deal of responsibility, and we have been up to the challenge for a quarter of a century and counting. If you are looking for armed guards or unarmed guards for any reason, you have found the ideal local resource. We have assembled a team that consistently exceeds expectations, and this is how we have been able to grow our business over the years. The armed guards and unarmed guards that we send out in the field are highly qualified, experienced professionals, and they take what they do very seriously. When you are a security guard, you have to be prepared to act effectively during a crisis. At the same time, preparation is also very important. We use advanced analytical processes to assess risks, and our technological capabilities allow us to overmatch any threatening individuals or entities. Miami Beach, Florida event security is one of our specialties. If you are responsible for organizing any type of special event, whether it is a small party or a large gathering of thousands of people, special event security is going to be a priority for you. We can gain an understanding of your security needs and implement a plan that will keep everyone at your gathering safe at all times. We also offer security patrol services for businesses, communities, and institutions in our area. A regular security patrol can be poised to react to threatening circumstances, but it can also serve as a very powerful deterrent. Our company can be engaged to dispatch armed guards or unarmed guards, and we can custom craft a security solution to ideally suit your specific needs. Personal security can be extremely important for recognizable people who hold high profile positions. Corporate executives, professional athletes, politicians, visiting dignitaries, and others can require advanced personal security solutions. 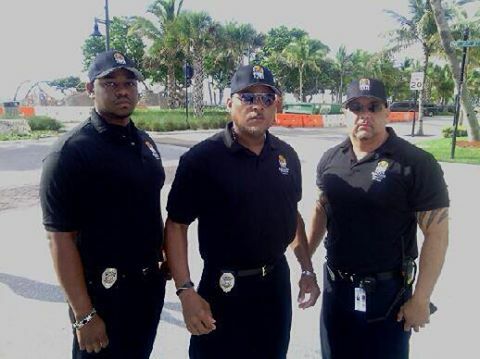 Our Miami Beach, Florida security service is well-equipped to handle all of your personal security needs. You may understand the fact that you need a security company, but you may not know exactly how to proceed. We fully understand this dynamic, and we would be more than glad to gain an understanding of your situation and make the appropriate recommendations. To speak with one of our Miami Beach, Florida security service consultants, call us right now toll-free at 800-493-0806 or 954-668-2780.